This weekend is the true kick-off of food truck season. Yesterday was the opening of the Red Hook Ballfields with pretty much any kind of Latino food for sale. I especially love The Country Boys, last year's finalist at the Vendys. 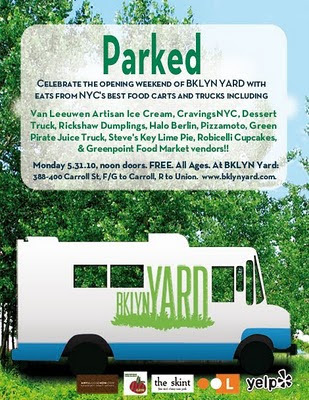 Tomorrow is Bklyn Yard's Parked. 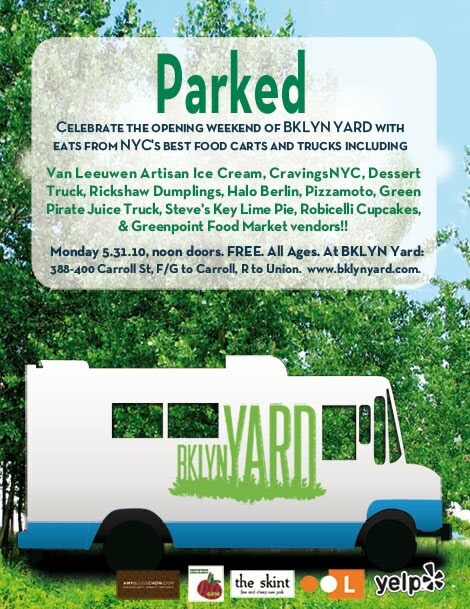 A lot of my favorite trucks will be there (Van Leeuwen Artisan Ice Cream, Rickshaw Dumplings) along with new ones that I can't wait to try (Green Pirate Juice Truck, Steve's Key Lime Pie). On June 2, the Big Gay Ice Cream Truck hits the streets again. And, after that I'm planning to crawl from one vendor to another in midtown, from Rafiqi on 44th and 5th to the fabulous Halal truck on 53rd and 6th. With the weather as glorious as it is now, this is the time to grab a bite and sit outdoors. Has anyone tried the Blueprint Cleanse? I'll definitely need it!